Has your dog been diagnosed with a Cranial Cruciate Ligament (CCL) tear, an Achilles tear or another type of injury or deformity? Are you looking for an alternative to surgery or are you concerned about your pets instability? Mayo Veterinary Services now offers Custom orthotics, CCL and Achilles braces for dogs ~8-120 lbs. These braces are not a curative solution for CCL ruptures. However, not all dogs are good candidates for surgery. 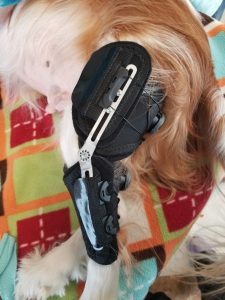 If your dog poses a high anesthetic risk (due to old age or a medical issue) or if you are unable to afford surgery, a CCL brace can provide additional stability to the injured knee. Fitting the brace to your dog’s knee takes approximately 45 minutes. Mayo Veterinary Services offers in-hospital fittings. We also offer shipping anywhere in the United States if you are not located in the Puget Sound area. Please also note that the brace size is not just based on weight, but can be influenced by your pet’s breed and tibia length. As these braces require quite a bit of work to fit, we do not accept returns or provide refunds for braces once they are purchased. 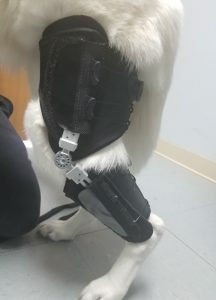 A $50 Exam/FittingFee will be charged if you would like us to fit the brace to your pet.